Ok, so I am finally getting around to writing about the important stuff! David and I fished with guides for 8 days at Magic Waters. We were able to see a lot of their water but not all of it. We were there late in their season and during a low water year. Some of the water that we wade fished they would normally float. And some of their other water we didn’t fish at all because of the lower water levels. Our overall take on the fishery was that the fishing was great. But what really stood out for us was the beauty of everything that we fished. Not just gorgeous water but also incredible surroundings. 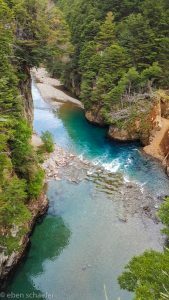 We did a poor job with photos but trust us, it is an awesome place to fish. We actually started on the small lake, or lagoon, right at the lodge. Just an hour on our own on our arrival day. 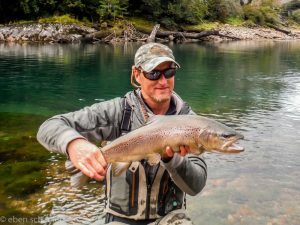 Aggressive strikes on big dries by mid sized, beautiful brown trout. It is a great way to fill a little time if you actually get some. Our guided days gave us all the fishing we could handle every day so we didn’t use the lagoon as much as we thought we would. 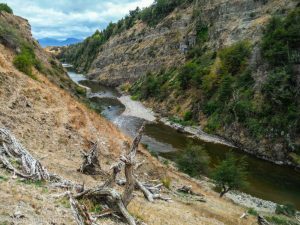 We fished the Paloma River and the lower end of Lake Elizalde the first day and again later in the week. The guides use a cata raft with a jet drive outboard. This system let us float down stretches throwing streamers and go back up and cover the opposite bank on the next trip down. The water is that beautiful glacier color and held mostly browns. The clear water let us see the chases. 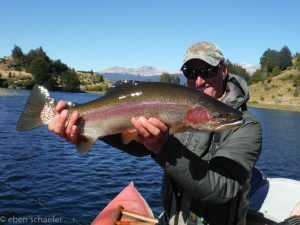 Then we went up into the lake and threw streamers and dries to cruising fish on huge flats and around the shoreline. The whole area is surrounded by mountains and rain forest and is stunning. Next up was the Rio Simpson. We fished this system a few times during our stay. The different sections that we fished were fairly different in character and size. What was consistent was the number of fish. Lots of bug life and features to the water. We nymphed the first day on the Lower and probably caught the combination of the most and biggest fish of the trip this way. Some really nice rainbows, especially. This system looks a lot like a Montana freestone river. The middle section was in a canyon and was spectacular. The fish were smaller but lots of them. They were eager and scrappy, too. And we had some shots at trophies, too. This was dry flies in perfect riffle/run water. waterfall and then we had lunch in the sun room of his house just 100 yards away! Absolutely incredible. 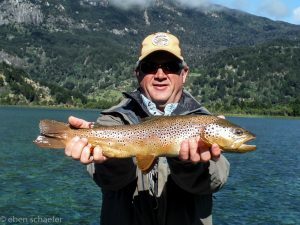 The lake had some great dry fly fishing, too. Big fish clobbering big dries. We fished a small lake that i don’t think even had a name. We even did some trolling there. We only caught two fish but they were big. And there are true monsters out there. It was “swinging for the fences” and worth it to have a shot at a 30″+ fish. There were several other rivers and lakes that we didn’t fish and lots of water we passed by on the systems we did fish. Some guests that left a couple of days after we arrived had extended their stay for a total of two weeks in order to get in more water. I can’t begin to do justice to the beauty that was everywhere as we fished so i have hardly tried. And in all of our fishing and driving around we only saw a few other fishermen during the whole trip. If atmosphere is important to you during your fishing this is the place to be. The fishing was excellent and consistent. I think that I may not have fully appreciated the quality of the fish because we caught so many great fish. All of the guides were great and we had no language issues at all. The variety of water and techniques was perfect. The difficulty rewarded the better fisherman but there were first timers at the lodge during our stay that caught lots of fish, also. I think it is a trip that is appropriate for all skill levels. 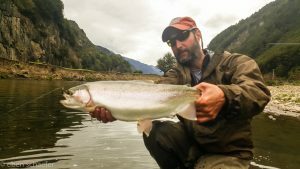 Oh, and the guides don’t normally fish. But we are fishing guides and had to insist that they at least fished a little!